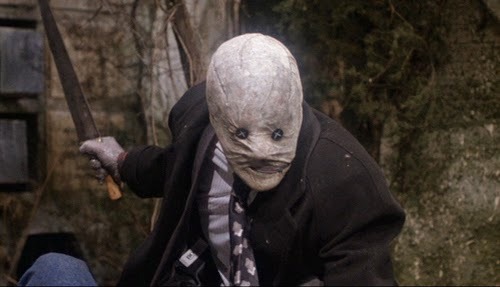 Even if you're a fairly nerdy fan of horror movies with a taste for the obscure like myself, there's a good chance you may not have heard of Nightbreed. The only reason I ever knew it existed is because I happen to be a fan of the author and director Clive Barker, most well known for the Hellraiser series (or at least the novella and first two films). Because I popped my Stephen King cherry last time around, I thought this time I'd take a look at one of his contemporaries, or rivals depending on how you want to look at the literature business. Based on the novella Cabal, packaged here in the states with several other short stories in the Books of Blood series, Nightbreed is the story of Midian, a mysterious town overtaken by its graveyard where monsters seek sanctuary from a world that hates and fears them. Sort of like the Underworld from Little Monsters, but with considerably less Howie Mandel. Before I begin, I should stress that I am watching the original (I assume theatrical) cut of Nightbreed, or whichever release corresponds to the old school VHS copy I have on my shelf. That is to say, I am not reviewing the infamous Cabal Cut, a bootlegged version reputed to contain a considerable amount of additional footage spliced together in a way supposedly much closer to Barker's original intent. To my knowledge, this version has not been given an official release, and any unofficial one I might find online could be anything, so I'm avoiding it for now. From what I understand, The Cabal Cut or something similar to it is scheduled for an official release sometime later this year from Shout Factory, and if and when that happens, I'll definitely be checking it out, and may post an addendum to this if I feel it is warranted. 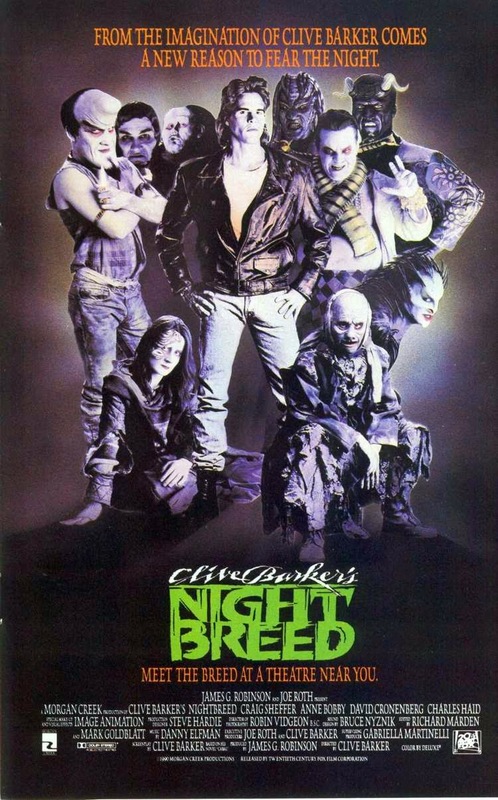 As I obliquely referenced, Clive Barker was somewhat dissatisfied with the final cut of Nightbreed despite having written and directed the film himself based on his own story. This is a common issue with Barker adaptations, never quite living up to the source material, and never being able to adequately depict the disturbing and visceral imagery present in the text. That is usually the problem anyway (we'll get to Rawhead Rex eventually), but its somewhat ironic in this case, since this is one of the rare examples of a Barker story where the supernatural elements are barely given much explicit description at all. This is the first case on this blog where I'm actually reading the novella for the first time, my only prior experience being with the movie, but after having examined them both in succession, I find Barker's issue here somewhat puzzling. Even though I still feel that the changes made to Stephen King's IT from book to screen actually improved on the story (i.e. 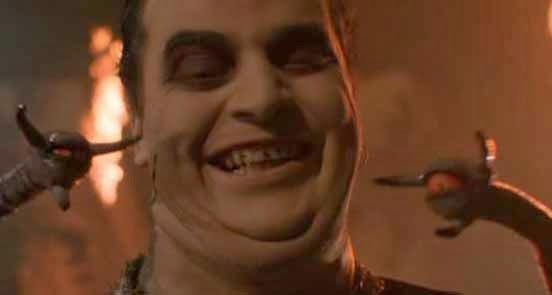 less kid orgies), King would have a legitimate complaint in saying that the result did not represent HIS vision, but the same cannot be said for Nightbreed. Yes there are minor differences, as there always will be when trying to translate a story into a different medium, but all the important elements remain in tact. I can't really see how much editing could be done, or how much additional footage would really be necessary, to make it better or more faithful. The film places more emphasis on the male protagonist rather than his female counterpart as in the book, but otherwise, except for the original ending (apparently an alternate ending on the DVD), all the major plot beats are basically the same, for better and for worse. 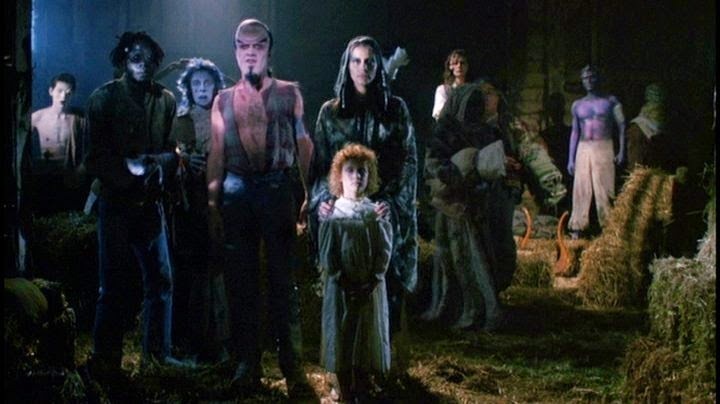 If anything, the film does more justice to the world of the Nightbreed than the book even does, if only by providing a much needed extended glimpse at just who and what these creatures are and how they live. Apparently Barker was always particularly excited about the franchise potential of Nightbreed, but just from reading the book, while it is still a fun and interesting story, there doesn't seem to be enough there to inspire one movie, let alone a series of them. The visual component is the missing piece of the puzzle, as you need to see Midian and its inhabitants to understand how massive and cool it and they are. 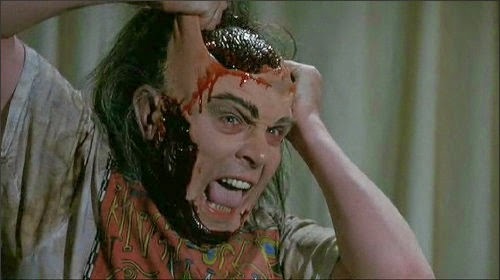 The film is a veritable extravaganza of early 90's practical effects work with a morbid sensibility that puts the best of Burton to shame, and if you don't feel bad for the lack of sequels after its over, I don't know what I can say to persuade you. 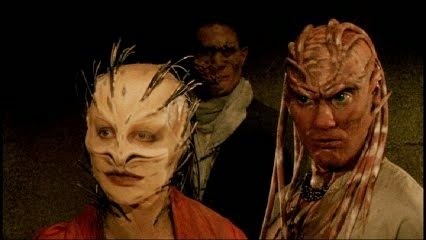 I've tried to avoid going into too much detail myself about the story and characters of Cabal/Nightbreed, if only to encourage you to read and watch it for yourself. I'd almost suggest that you don't really need to read the novella if you've seen the movie, as they are similar enough that you can get the same out of both, and the movie is more easily digestible and of course visually appealing, but that's not to say the original isn't worth a read in its own right independent of the film, as almost all of Barker's work is. And if by some chance you've only read the original and not seen the movie, definitely give the movie a chance. There are so many great things about it that the book just can't capture, like David Chronenberg in a rare acting turn as a serial killer, and a literally explosive third act that's basically nothing by monster on redneck action. Just go see it for yourself. Sorry, I know these are usually longer and more in depth, but I honestly don't have much more to say except that both are worthwhile. Also, no kid orgies. Thank Baphomet for that anyway.